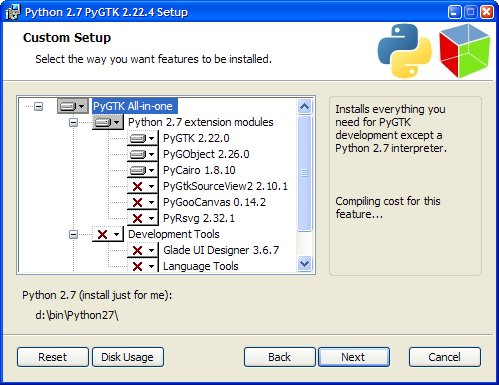 The PyGTK team is pleased to announce the return of the highly popular all-in-one installer for Windows. 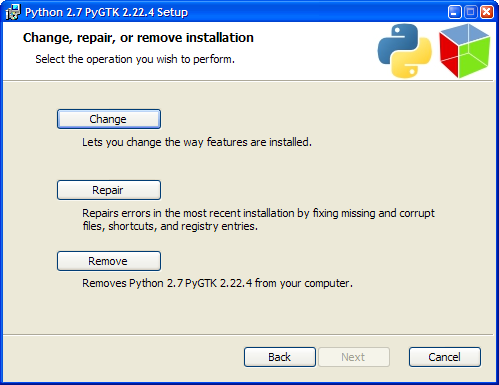 The PyGTK All-in-one installer provides an alternative installation method for PyGTK users on Windows. It bundles PyGTK, PyGObject, PyCairo, PyGtkSourceView2, PyGooCanvas, PyRsvg, the gtk+-bundle and Glade in one handy installer. 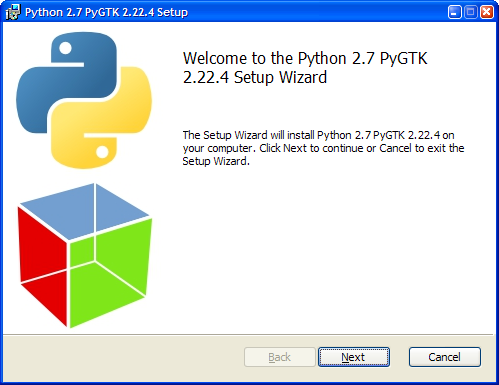 Currently 32 bit Python 2.6 and 2.7 versions are supported on Windows XP and above. Dieter Verfaillie deserves enormous thanks for this work. Firstly, he performed the tedious job of ensuring that all the component MSI installers were exactly correct, and secondly, the really difficult task of deconstructing these individual installers and reassembling their contents into a single cohesive executable. This is a true all-in-one installer, it does not simply call out to launch the individual MSI files. We are looking to collaborate with others who want to create gtk+ (and friends) all-in-one installers for Windows. We anticipate the tools to generate these installers will move to GNOME in future - perhaps in a common repository. Suggestions and feedback welcome.